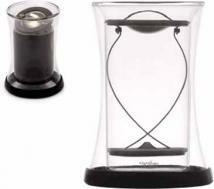 Auto pause & serve Lighted "on" switch Dishwasher safe carafe & basket Reservoir water level marks. 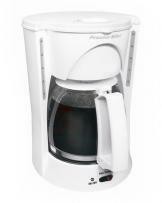 Size : 10.63" x 11.85"
2-12 cup Auto pause 'n serve Extra-large water fill area Easy-fill, pull-out filter basket Dishwasher safe carafe and filter basket Comfortable carafe handle Hydro-Clean system 1000 watts for fast, flavorful coffee. Size : 12" x 8.5" x 12.69"
Unique internal cord wrap, Safety on/off button, Compact Euro-style design, Stainless steel blades, Large capacity, See-through lid, Lid sits flat on counter top. Unique internal cord wrap Safety on/off button Compact Euro-style design Stainless steel blades Large capacity See-through lid Lid sits flat on countertop. Size : 4.08" x 3.64" x 7.23"
Auto pause & serve Lighted "On" switch Dual water windows Dishwasher safe carafe & basket Nonstick hot plate. 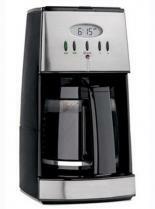 Size : 10.63" x 11.85"
Auto pause & serve, Lighted on switch Dishwasher safe carafe & basket, Reservoir water level marks. Brewfish makes perfect press coffee or tea. 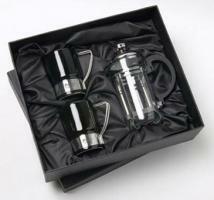 The super light insulated press filter, double-wall thermal glass and drink through top keep your brewed beverage hot. 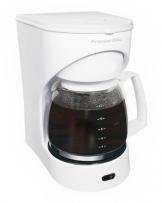 Stir in hot water with your favorite ground coffee beans or tea. 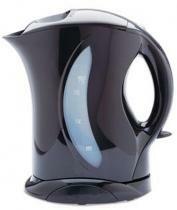 Let sit several minutes to brew then SLOWLY press the filter down. Voila! A gourmet beverage as easy as instant! The "GoodSeal" shuts off the brewing so your drink stays perfect 'til the last sip. Tilt the top to drink or pour and tilt it back to close. Made of glass, stainless steel and the highest standard food safe silicone. Microwave safe glass and top shelf dishwasher safe for both glass and filter. Holds 10 oz. brews 8 oz. Dimensions: 3 3/4" W x 5 1/4" H x 3 3/4" D Imprint Size: 1 1/2" W x 2" H. Other decorating methods are available for this item, please call. Packaging: Retail Box Carton Dimension: 18x16x10 Shipping Weight: 12 qty -12 lbs. 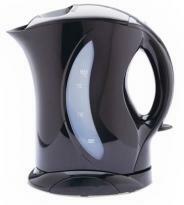 1.7 Litre Cordless base, portability of stove top kettle Immersed heating element 1500 watts of power for rapid boiling Non-spill spout design Safety locking lid Boil dry protection Water filter On/off light Auto shutoff Dual water window. Size : 9.5" x 6.69" x 9.88"
1.7 Litre, Cordless base, portability of stove top kettle, Immersed heating element, 1500 watts of power for rapid boiling, Non-Spill Spout Design, Safety locking lid, Boil dry protection, Water filter, On/off light, Auto shut off, Dual water window. 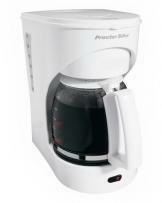 Auto pause & serve Brew strength selector Auto shutoff Dishwasher safe accessories Dual water windows Permanent filter included. Size : 9.63" x 8.63" x 11.88"
Removable grinding chamber is stainless steel and dishwasher safe, Hands-free operation, Precise cup & fineness settings for perfect results. Retractable cord, Coffee scoop & brush included. 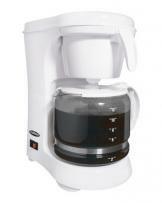 Makes 12 to 42 cups, Ready-to-serve light, Easy to fill, 2-way dispenser, Twist-lock lid and large handles, Removable cord Easy to clean and store. Cup-per-minute brewing speed Water-level indicators Ready-to-serve light Removable cord Glossy aluminum finish Comfortable handles Twist-lock lid Dishwasher safe lid and brew basket. Size : 11.54" x 11.54" x18.56"
Hot, flavorful coffee, Drip-free spout, Detachable cord, Stainless steel permanent filter basket, Ready-to-serve light Automatic keep warm. Hot, flavorful coffee Drip-free spout Detachable cord Stainless steel permanent filter basket Ready-to-serve light Automatic keep warm. Size : 10.3" x 5.9756" x 13.79"
1500 watts of power for rapid boiling 1.7 litre/1.7 quart Concealed heating element 360° cordless base Auto shutoff Boil-dry protection Mesh filter Drip-free pouring Water level indicator. 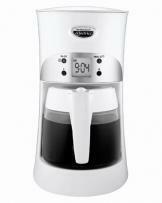 Size : 9.04" x 6.95" x10"
Stainless steel accents for classic kitchen style, Drip-free carafe, Programmable clock/timer, 2 hour auto shutoff, Auto pause n serve. Nonstick keep-hot plate, Easy-view water window. Fineness selector has 17 positions from fine to coarse (adapted to each type of coffee maker), Quantity selector for 2 to 12 cups. Coffee bean container with lid holds up to 8 oz. 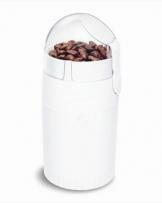 Removable ground coffee container removes easily for measuring ground coffee into coffee maker. 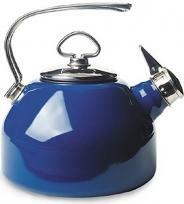 The Classic 1.8 quart enamel teakettle has a Hohner harmonica whistle. 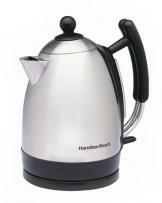 The teakettle has long lasting stainless components for durability & an extra large lid opening for easy cleaning. 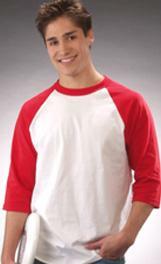 The enamel lining is mineral resistant. 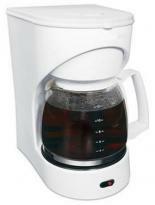 Advanced No-Scorch Heater, Automatically adjusts to maintain coffee's just- brewed temperature without scorching it, for fresh flavor cup after cup, Drip-Free Pouring, Specially designed carafe prevents drips and spills when pouring a cup or filling the reservoir, Programmable Clock/Timer with Automatic Shutoff Lets you wake up to fresh coffee, Coffeemaker shuts off automatically after two hours for worry-free brewing, Accelerated Brewing and Pause & Serve, Brews in less than a minute per cup when brewing 12 cups, Pause & serve lets you sneak a cup before brewing is complete. Size : 15.1" x 11.25" x 16.5"
Cafe quality made easy Powerful 15 bar pump No-fuss frother Easy-fill reservoir Works with pre-measured pods or ground espresso Enjoy authentic espresso and cappuccino anytime. Size : 11.14" x 10.16" x 13.82"
Café quality made easy, Powerful 15 bar pump, No-fuss frother, Easy-fill reservoir, Works with pre-measured pods or ground espresso, Enjoy authentic espresso and cappuccino anytime. 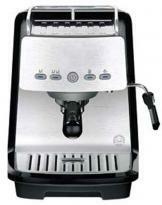 Krups Espresso/Cappuccino/Latte Maker, a programmable 15 bar pump machine makes cafe quality espresso. Thermoblock heating ensures optimal temperatures & pressure. Removable stainless steel drip tray. 32 oz removable water tank. Uses coffee or ESE pod.